For some of us (and I include myself here), dry winter hair seems like an unavoidable fact of life. We fight off the worst of the frizzies with deep conditioners and smoothing products. 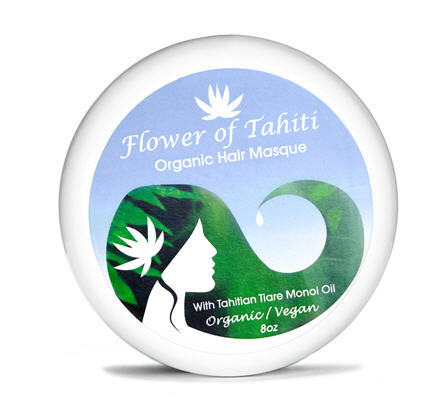 I've certainly tried my share, but the Flower of Tahiti Organic Hair Masque ($22, available at BeautyMark) is probably the first organic vegan formula I've used. Its main ingredient, Tahitian Monoi Oil, is a blend of coconut oils and Tahitian gardenia petals, and has been used by indigenous Polynesians as a skin and hair softener for the last 2,000 years. 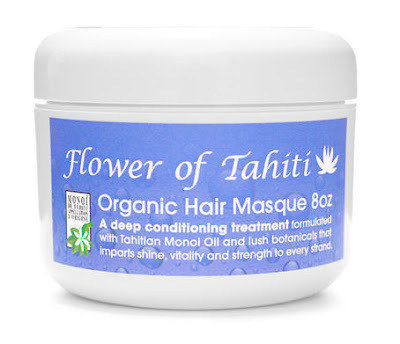 Flower of Tahiti's creator, Jennifer Pedraza, used a homemade Tahitian Monoi Oil hair masque on herself for many years before she was inspired to package and sell her concoction. "It is so gentle, being organic and vegan, that anyone can use it really," explained Pedraza when I asked about who would benefit most from using Flower of Tahiti. While the much richer original formula is suitable for those with thick and/or curly hair, the new light formula is ideal for fine/oily-haired gals. How you use it is up to you and your needs. Use it daily as a rich conditioner; use it as an ultra-hydrating treatment by leaving it in for 30 minutes and then rinsing it off; apply it to your hair before swimming in the ocean or the pool to protect yourself from the drying effects of salt and chlorine. I've been using my review sample as a deep-conditioning treatment and I approve. After washing my hair with 2-in-1 shampoo, I usually work a dollop of the hair masque into my hair and let it sit there while I continue with the rest of my shower, then rinse it off at the very end. Despite its super-moisturizing benefits, Flower of Tahiti is lightweight and non-greasy, and its coconut scent is pleasant without being overpowering. My hair feels soft and frizz-free at the end--no need for silicone-based smoothing products! Interested in trying the Flower of Tahiti hair masque for yourself? Pedraza has generously offered a full-size masque to one lucky Solo Lisa reader. This giveaway is open to Canadian and US residents. Simply leave a comment on this post explaining what you do to combat dry hair by Friday May 4th, 12pm PST. All entries must have some means of contact (email or Twitter); any entries that do not have a means of contact will be disqualified. One winner will be chosen randomly. Good luck! My hair is really dry and frizzy, so I would be thrilled to win. To combat it, I wash it every other day and use a good conditioner. My hair has been such a mess lately, just happened a week or two ago! Got so frizzy and dry, I may have to give this a go! I usually use a hair masque from Sally or I do a hot oil treatment. Lisa, thanks for the introduction to this product! Sadly I don't have a great way to deal with hair issues – my hair has suddenly been behaving badly, drier and more static-y than usual. I shampoo and condition every second day instead of daily, and sometimes put in a drop or two of smoothing serum when styling ... but I could use a better solution, and this might be it. Really like your blog – you've introduced me to a lot of great things! I wash my hair every other day and let my hair air dry. I love this product already, the only hair I buy, just spectacular! I use hot hair tools as little as possible. My hair is super dry because I overuse my styling tools :/ so I usually use the body shop deep conditioning treatment (rainforest moisture hair butter) and then put on Argan oil once I'm out of the shower! Would love to try a hair mask! I absolutely love this product, i refuse to buy anything else!